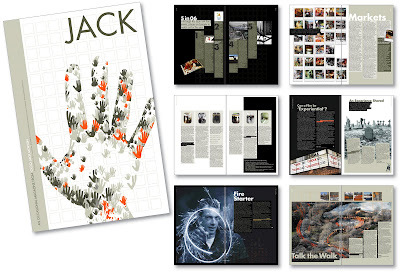 An over-sized in-house marketing magazine for Jack Morton. I must admit the design and general look of it must go to the wonderfully talented Matt Hoare (that's his hand on the front), but I helped to pull the artwork together, re-jig and tweak a lot of the layouts, streamline the type, style sheets etc. A lovely job. I worked on the subsequent one too, but unfortunately I have no ref of that.